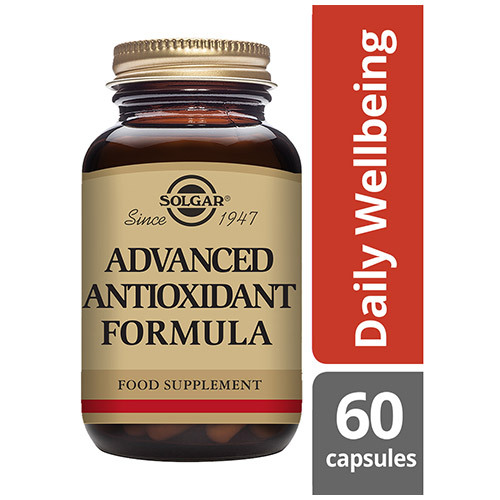 Solgar® Advanced Antioxidant Formula is an all-encompassing antioxidant formula containing several vitamins and minerals to assist in minimising the damage caused by free radicals. Free radicals are produced by the body when you breathe, digest food, exercise or even sleep. They are naturally occuring as they are created by emotional stress, ultraviolet light, radiation and air pollution. Free radicals damage the body by causing deterioration of the cells, lower the defences against diseases and putting the body into a ‘stress’ state. To counter the effect of free radicals, a balance of antioxidants is required. The most important Antioxidants include: Beta-carotene, Vitamin C, Vitamin E, Zinc, Selenium and components found in certain plants including Turmeric, and Ginkgo biloba. Antioxidants can be obtained by eating a healthy and balanced diet, but taking a supplement might be desirable to achieve an optimal intake of antioxidants. 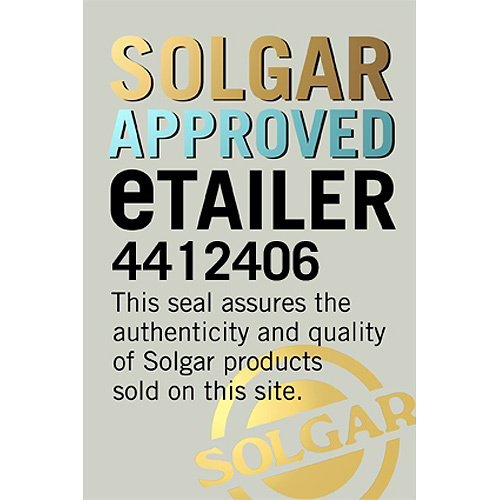 The special Solgar® Advanced Antioxidant Formula combines the vitamins C and E, with minerals such as Zinc, Selenium and Copper, all of which have strong antioxidant benefits. To create a holistic approach, several amino acids have also been included in this formula. Several food based biocompounds have been used to create this specialist formula such as Green Tea, Red Wine and Pycnogenol (a US registered trademark name for products which contain bark from the French maritime pine tree). Plant based antioxidants have been added to further strengthen the combination, using Ginkgo biloba, Spirulina and Milk thistle. Solgar® Advanced Antioxidant Formula is suitable for those on a vegan diet and to be taken as 2 vegetable capsules daily, containing both vitamins and minerals, as well as amino acids. Vitamin E is a fat-soluble vitamin and an essential nutrient as it is a primary antioxidant. It also contains natural Vitamin E (d-alpha tocopherol). Rose hips contain bioflavonoids which naturally occur with vitamin C in nature. Bioflavonoids help to enhance the absorption and bioavailability so make sure you will receive all the benefits form vitamin C.
Tocopherol is a form of vitamin E derived from vegetable oils and with strong antioxidant capabilities. 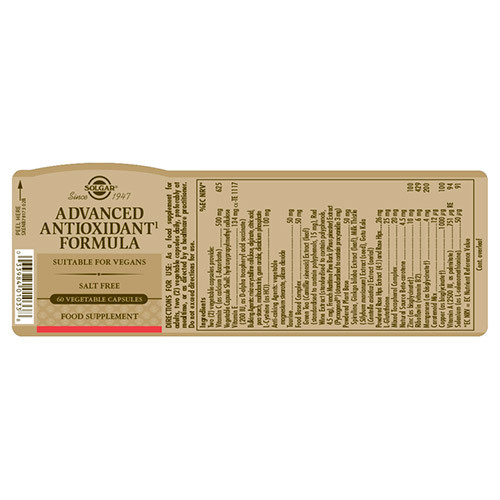 Also contains: Vegetable Capsule Shell (hydroxyproplmethy cellulose), Food Based Antioxidants (powdered extracts of green tea [15mg polyphenols], red wine [4.5mg polyphenols] and Pycnogenol [3mg procyanidins]) Anti-caking Agents: vegetable magnesium stearate, silicon dioxide. Bulking Agents: Microcrystalline Cellulose, Alginate, Citric Acid, Pea Starch, Maltodextrin, Gum Arabic, Dicalcium Phosphate, L-Cysteine (as HCl). As a food supplement for adults take two vegetable capsules daily, preferably at mealtime, or as directed by a healthcare practitioner. 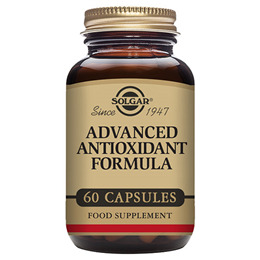 Below are reviews of Solgar Advanced Antioxidant Formula - 60 Capsules by bodykind customers. If you have tried this product we'd love to hear what you think so please leave a review.